After you've chosen a crate you'll want to learn how to get your dog to love their crate. But first — it's time to choose your dog's crate! There are different options out there, and the type you choose depends on what you plan on using it for, where it will be placed in your home, and your dog's size, behavior, and needs. And, believe it or not, sometimes you'll want more than one crate for your dog. 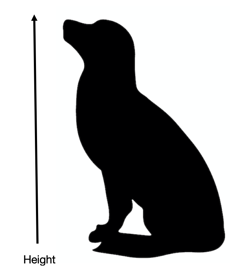 When your dog is standing on all fours, measure them from tip of nose to base of tail (do not include their full tail length in this measurement — this will result in a crate that is too large). Add 2 to 4 inches to this measurement for the best length of crate for your dog. When your dog is in a Sit position, measure from the floor to the top of their head. 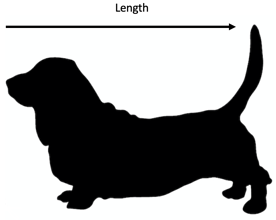 Add 2 to 4 inches to this measurement for the minimum height needed for your dog’s crate. You do not need to measure for the width of the dog crate, as this is based on the length and height measurements of the dog crate. Double-check that your dog is within the manufacturer's recommended weight limit for the crate you choose — just in case you're carrying the crate with your dog inside it. If you have a still-growing puppy, there are crates that include a divider panel that you can use to make the crate space "grow" with your pup. This is extra useful because it means you don't need to buy multiple sizes of crates, as they get bigger. You don't want to give your puppy too much space in their crate because it can derail their potty training if they learn it's okay to potty in one corner and sleep in the other. 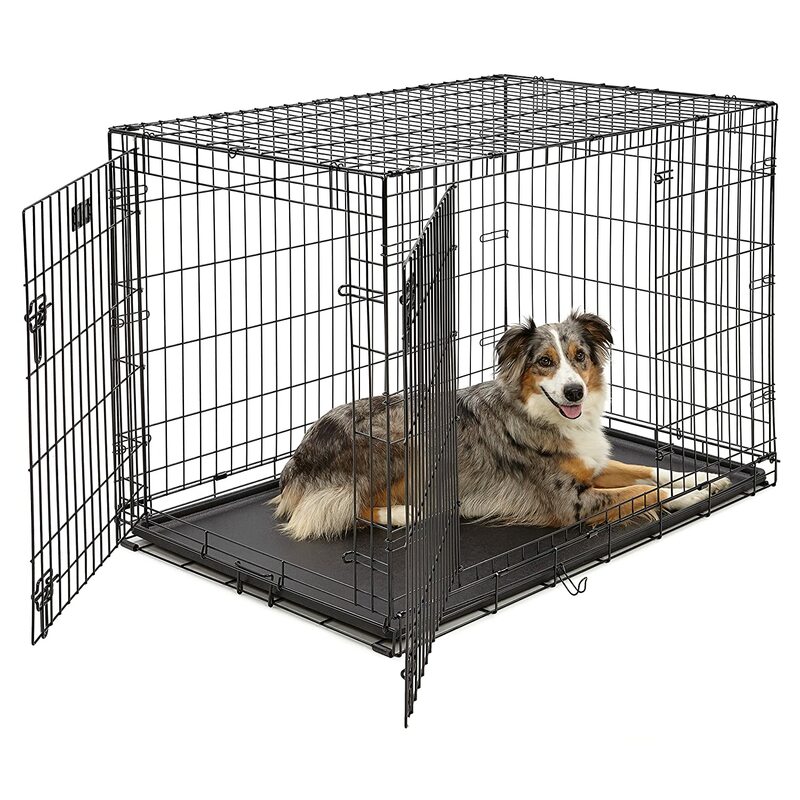 Metal dog crates, like the ones mentioned below, usually include an extra panel to make the interior of the crate the correct size. If you're purchasing an adult-sized dog crate for your puppy because you know what size they will grow to, estimate their full-grown height and length based on their breed or breed-mix (or speak with your breeder about what size is best for their eventual adult size based on their parents' size). What Kind of Crate Works Best for Your Needs? 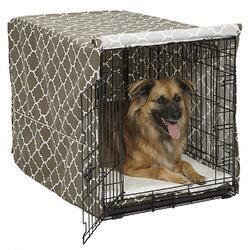 These are a great option if your dog needs a bit more privacy while in their crate. If you plan on traveling with a large dog on a plane, these crates can be a good option (which is why they're commonly called airline kennels). Our top picks are the Aspen Pet Porter and the Petmate Sky Kennel. 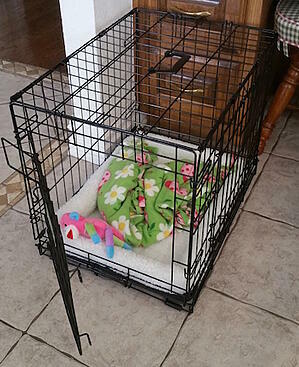 If you're setting up and keeping your dog's crate in one place at home, a metal dog crate is a great option for you. These are the most popular crates as they can be modified in a variety of ways with dividers, crate covers, and DIY furniture built around them to camouflage into surrounding home decor. We recommend the MidWest iCrate because of the two-door option, divider panels and the ability to easily attach to their ex-pen panels. Adding a cover to a metal crate: If you choose to use a wire crate, like the MidWest crate featured, you may want to consider adding a cover (make sure to choose the size that fits the crate you have). It's not necessary for making your pup more comfortable, but it could possibly help by creating a more den-like space for them. This would be a preference only your dog can weigh-in on. 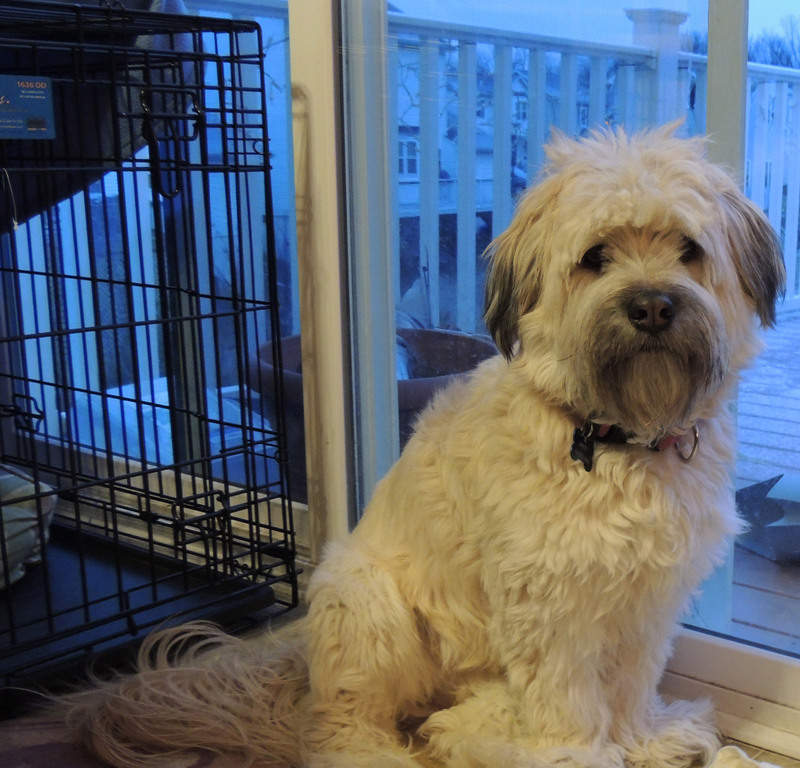 Does your dog naturally settle underneath tables, desks, or other more enclosed spaces? They might like a cover over their crate. Test it out and take note if your dog seems more relaxed with a cover on or off. 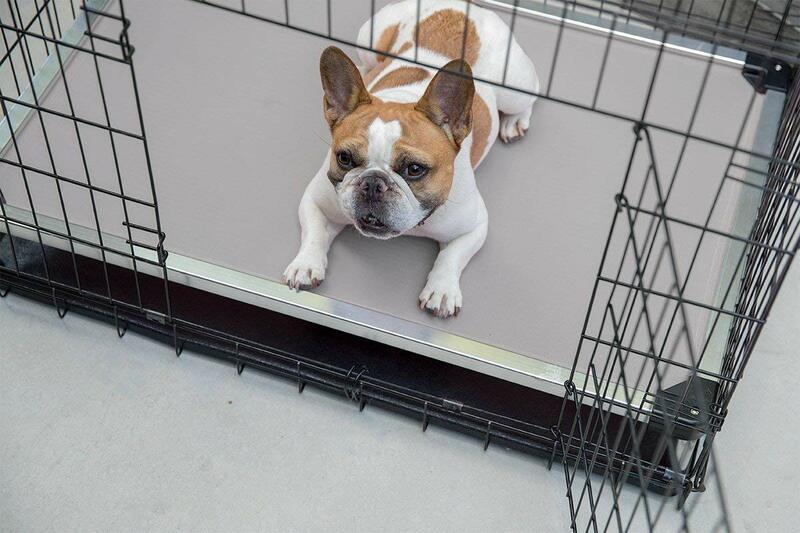 If your dog is helped by having their crate covered, a correctly fitted crate cover is a better option than towels, sheets, etc., as this fits more snuggly, is designed to allow better airflow, looks nicer, and is less likely to get pulled through and eaten. However, if your dog does have a habit of pulling their crate covers through and eating them, I recommend against covering their crate in general. 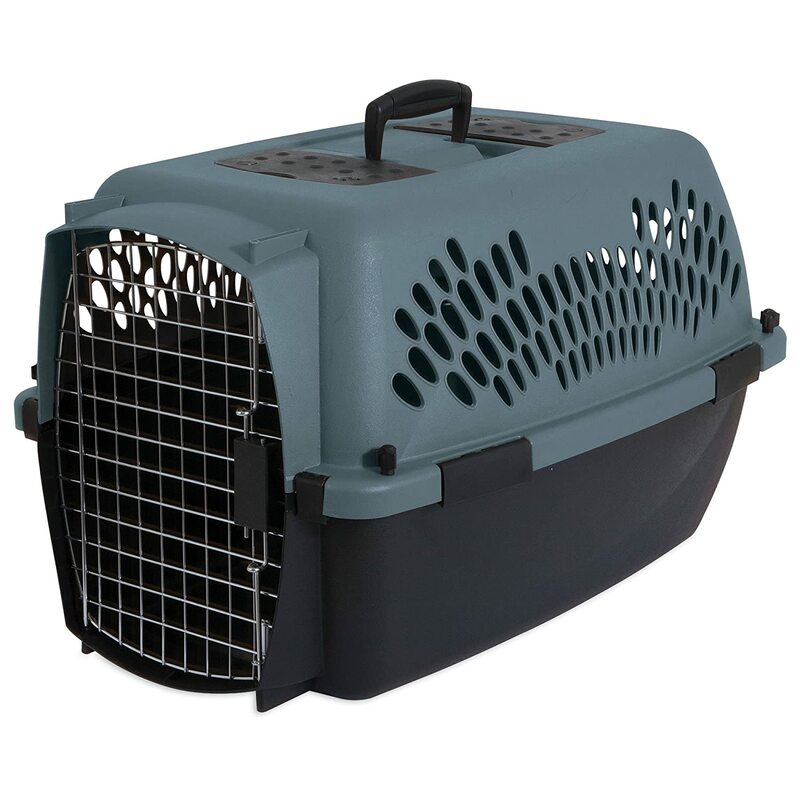 A soft-sided crate is super portable for easy travel and temporary crating. If you bring your dog to work, a portable crate can be a wonderful under-the-desk option to give your dog a safe place to hang out and chill. 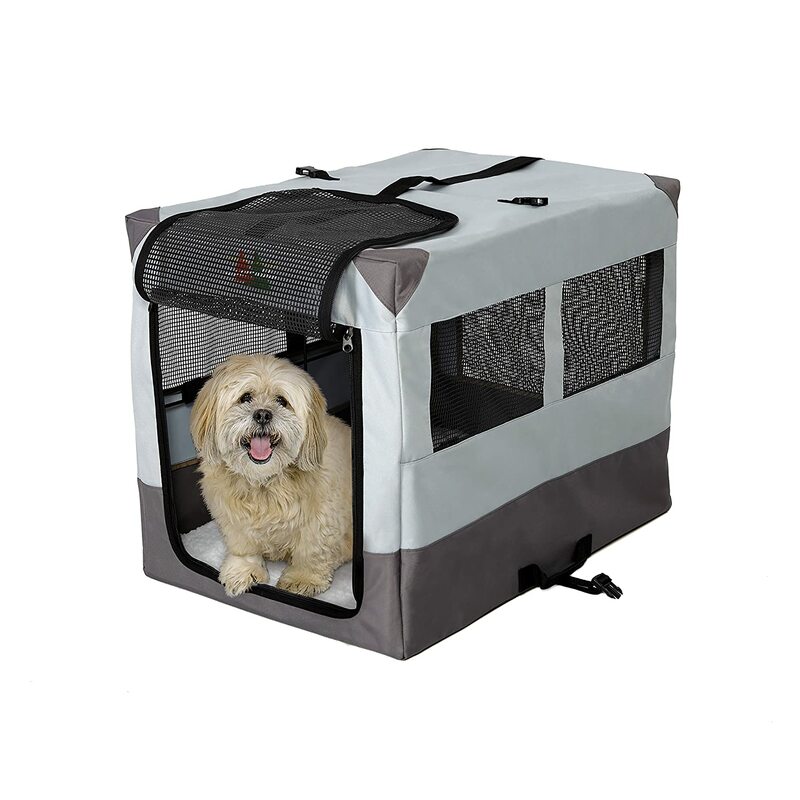 This option by MidWest has great airflow with multiple windows and is one of the sturdier soft-sided crate models. Does you dog pull a Houdini and escape from crates? Or are they big chewers? 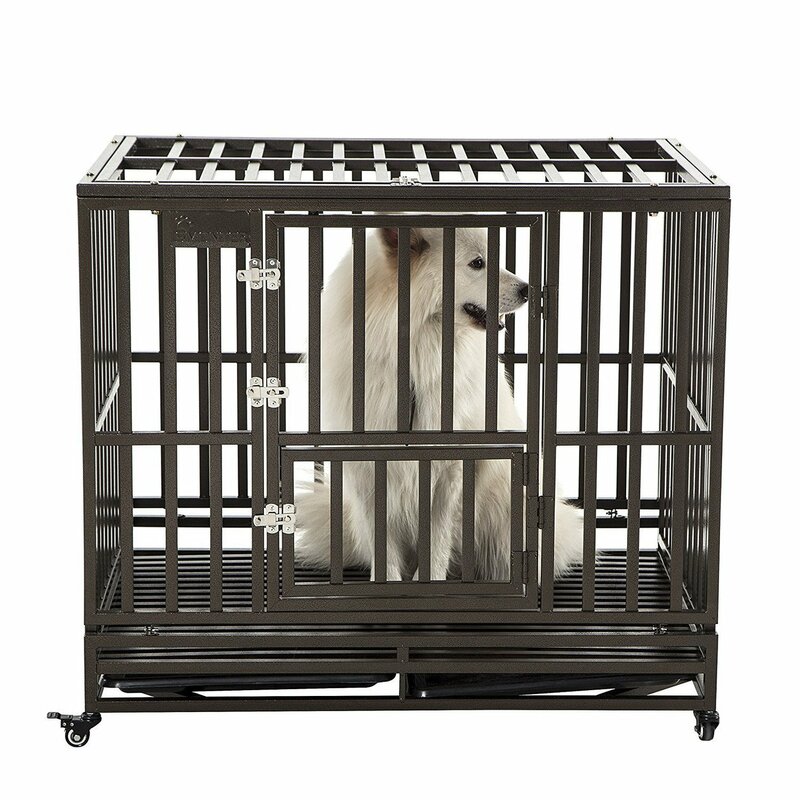 Heavy duty dog crates are made specifically for these behaviors, often featuring riveted metal and double locks. Heavy duty dog crates are the best option for crash protection if you plan on using a dog crate in the bed of a pickup truck or in the back of your van or SUV (Note: these crates tend to be too large and heavy for smaller and mid-size cars; we recommend using a crash-tested dog seat belt harness in those instances). The Center for Pet Safety crash tested a variety of crates, and regular metal dog crates did not fare well in the tests. They named the Gunner Kennels G1 Intermediate Heavy Duty Crate (secured with Gunner Tie-Down Straps) as the 2015 Top Performing Crate for crash safety. Learn more about keeping your pet properly restrained while traveling in this article. 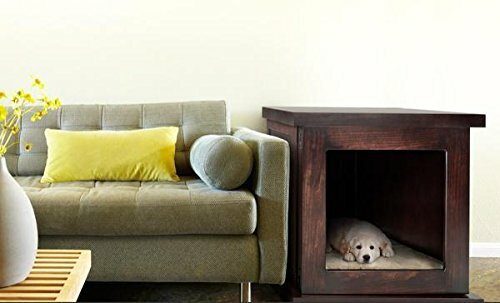 If you live in a small space, you can combine your dog's crate with a functional piece of furniture that best matches your home's decor. The Zen Crate is our favorite furniture crate option as it has extra features that help ease anxiety and noise phobias. They're often out of stock on Amazon due to their popularity, so you can pre-order them on their site, and you have to buy the door insert separately if you want one. Ex-pens — the "not quite crates"
Exercise pens (a.k.a. Ex-pens, for short) are another type of confinement system for puppies and dogs. Unlike crates and kennels, ex-pens are open on the top and are more flexible in terms of their shape and size, as you can often adjust the shape and size to fit your area and your dog's size and, shall we say ... maturity level. They're perfect for combining with your dog's crate like the Midwest crate to set up your dog's safe space or a puppy zone. Watch this video to see how ex-pens are attached to a crate to create a puppy play pen. Now that you have a better idea of what size and type of dog crate to purchase, you're on to the set-up phase! Where to Put Your Dog’s Crate? Custom-built: Some dog owners incorporate their dog's crate straight into their home, such as under the stairs or underneath their kitchen island. Check out these cool, custom built-in versions of crate space. What Goes in Your Dog's Crate? Choosing what to put in the crate with your dog is important for safety reasons and depends on various factors, such as age and behavior. Check out this article for a comprehensive look at what you should (and shouldn't) put in your dog's crate when your pup is left unsupervised. It’s nice for your dog to have a soft, comfortable surface in their crate. However, if your pup is inclined to chew (and possibly even eat!) their bedding — which many young puppies are — either look for a rug or pad that is “puppy teeth resistant” or leave out bedding altogether until your pup outgrows their mouthy, destructive stage. Of course, it’s not just your dog’s teeth that you need to consider when thinking about their crate bedding. You should also give some consideration to pee and poo, and how messy their “crate treats” might be. Going with a surface that’s easily cleaned or washable, and one that’s waterproof, is usually a good idea. These options recommended below are durable, comfortable, and waterproof, making them a good fit to cozy up the bottom of your dog's crate. The K9 Ballistics pad is comfortable, durable, and easy to clean (machine washable). It's also odor resistant and can stand up to most mild-to-moderate chewing due to the fibers used in its construction. 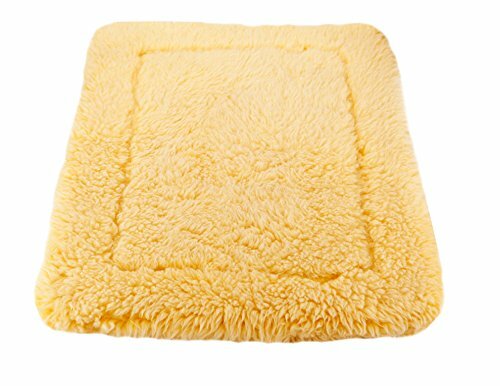 The Hugglefleece mat is another great option. 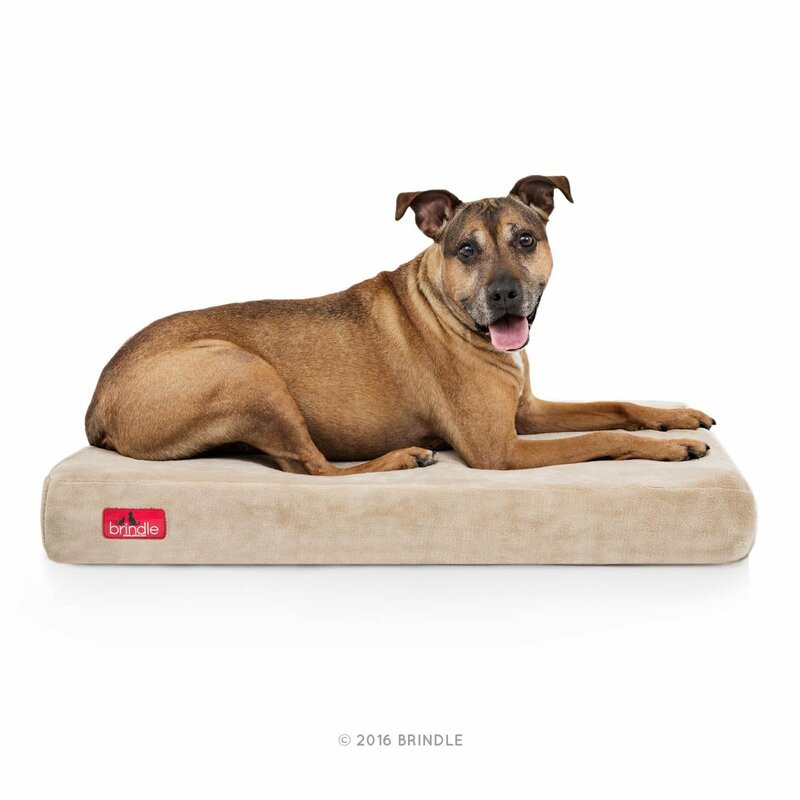 Completely waterproof and highly supportive, this great dog bed by Brindle is also quite durable for most dogs. A little pricey, but well worth the money. Also great for dogs with arthritis pain. This is one of the most "chew-proof" options for dogs and comfortable, too! 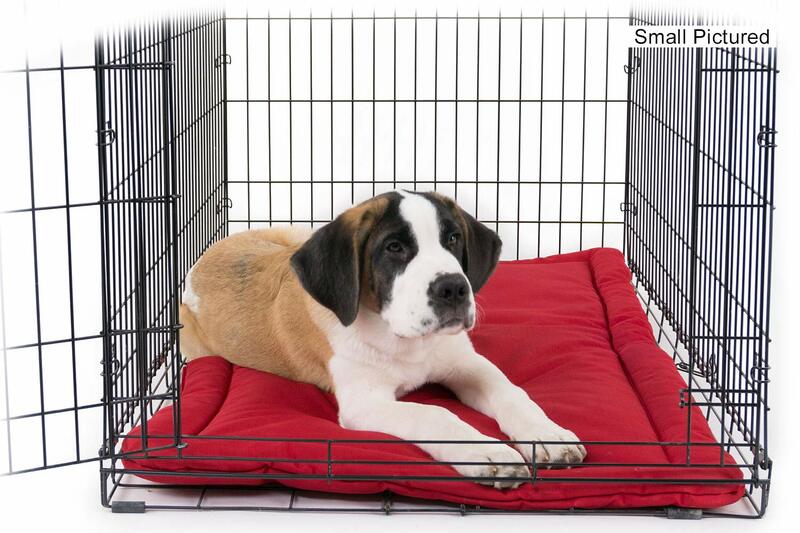 The K9 Ballistics "Cujo Cot" is a great option for many dogs and fits most standard-sized crates. It's also great in ex-pens, and even just out in the open when your pup is ready for that kind of freedom. It's a little pricey, but will last a long time and will help keep your pup (or older dog) super comfortable. 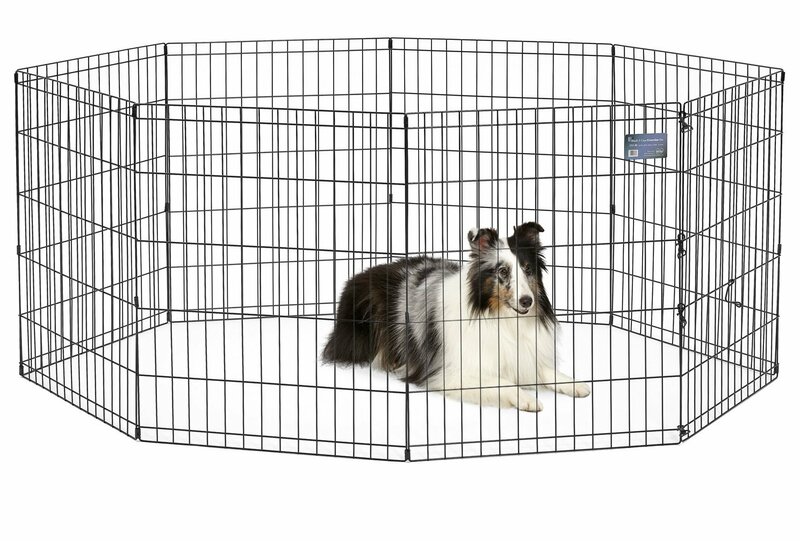 Given its elevated construction, it will also keep your pup from laying in any potty accidents they may have while in their crate and it can help to keep them cooler on warm days. The scent of you may be comforting for your pup, especially when they are very young or if they exhibit separation anxiety symptoms. Molly Mutt makes a great stuffable duvet that you can use to cover an existing bed or stuff with your clothes with this stuff sack. It makes for an easy, washable bedding solution and is a great use for old sheets and clothing. There's also a waterproof liner. And you can boost the “reassuring power” of your clothing by giving it a quick spritz with the Adaptil dog-calming pheromone (just a spritz or two does the trick, more is definitely not better when it comes to pheromones). Molly Mutt bed featured. It comes in many duvet styles. Crate Safety Note: Your Dog Should “Go Naked” in Their Crate! All puppies and adult dogs — and especially those who are still getting used to their crate — should have their harnesses and/or collars removed before being left alone in their crate. Harnesses, collars, and dangling ID tags can easily get caught on crate doors and between the bars of the crate, causing a huge and otherwise avoidable strangulation risk. If you feel you must keep a collar on your dog while crated, please use a breakaway style collar and lay-flat ID tags to mitigate the strangulation risk. Now that you've chosen your dog's crate and added comfortable bedding, it's time to crate train your dog and show them it's a great place to hang out! For more information, read this article about how to train your dog to love their new crate.